Good morning! I hope you're all having a great weekend! First thing this morning, I decided to play in Waltzingmouse Sketch Challenge #13! Accessories: Labels One Nestabilties (Spellbinders), 1 1/4" circle punch (EK Success), Black pearls (Kaisercraft), Iridescent Pearl glimmer mist (Tattered Angels), Sheer ribbon (May Arts), Bow Easy, Foam tape, Thread, Sewing machine. OOhh Stephanie! Stunning!! Dramatic!! LOVE the background pattern stamping!! Thank you so much for playing along with us at Waltzingmouse Stamps! 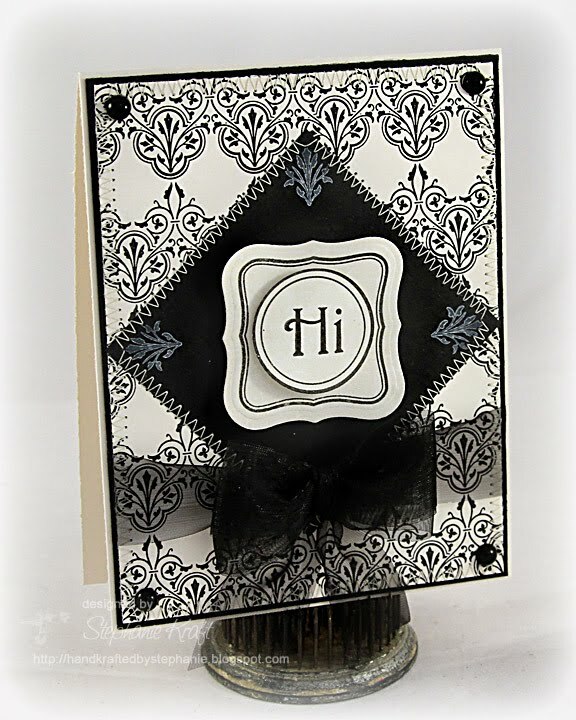 I love the contrast of the elegant card with the chirpy "Hi"! It's a really fun touch. Loving the black & white, it is so Elegant! Stephanie, such a classy sophisticated card. Love the simple colour scheme - so effective!! You used the same stamps as me but to such different effect - STUNNING!! How elegant in the black and white Stephanie! 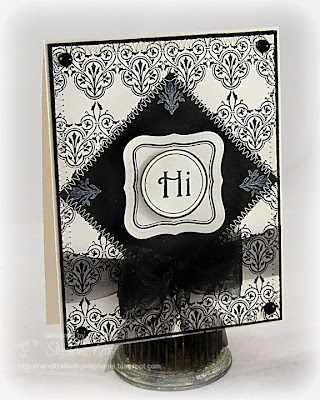 Love the frippery stamping and pretty ribbon! thanks for playing with the WMS sketch again this week! Stunning, love the background and colors!! Fab!! 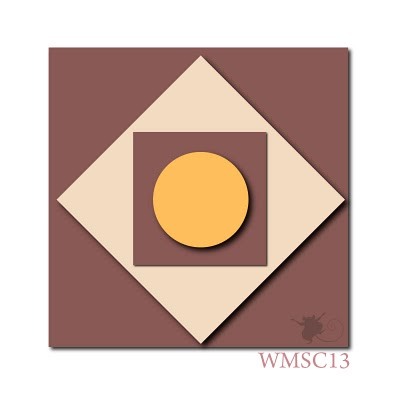 Thanks for playing along this week at WMSC! This is gorgeous Stephanie!! I love the background you created!! And the black and white is so rich and elegant!! That is a fabulous take on the sketch! Love the black and white always elegant! A stunner, so classy, I love it!!!!! I love how you've aranged the background, your card is very elegant. So striking and beautifully elegant in black and white!!! Gorgeous!! 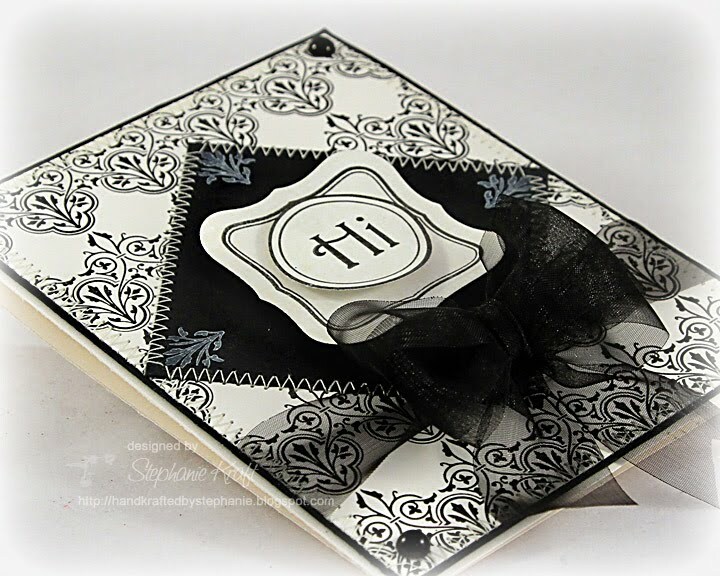 Such a classy & elegant card, lovely!